MVPVLP: Marc Van Peteghem and Vincent Lauriot Prevost, Naval Architects, have a fantastic site showcasing a full range of multihull designs. The work of MVPVLP includes simply revolutionary projects like the trimaran hydrofoil L'Hydroptère (above), and the evolution of this and other cutting-edge trimaran designs. 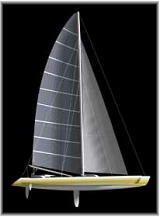 Their work also includes simply beautiful projects such as the Lagoon 67 and the Highest Honour sailing catamarans. 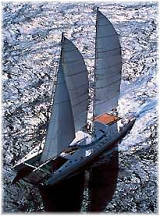 In 1998, the 138' Douce France was launched as the largest sailing catamaran afloat. These designs speak for themselves, but three dimensional flash wireframe animations, crisp drawings, and beautiful renderings really bring them to life on the screen.